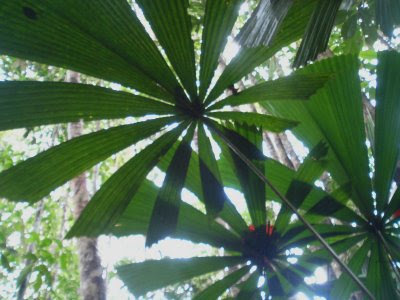 Walking below the jungle canopy behind my chalet, I checked on my collection of the Licuala Palm.Licualas are important for the locals here because the leaves are used to thatch sleeping mats, sun hats or to wrap food. They are native to Borneo and therefore Bintulu. Licualas can reach 4 meters high. 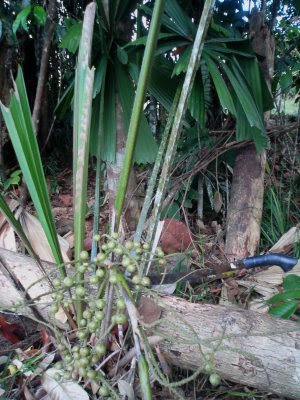 The leaves are borne from a long stalk. 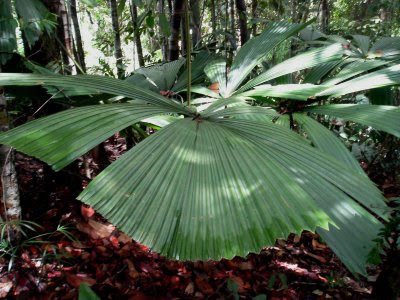 The Licuala stem is very short and mostly hidden in the thick humus rich environment of the tropical rain forest like ours here. 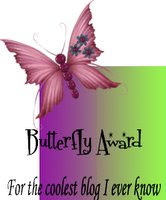 They prefer filtered light and do not grow well in a potty environment. I've tried many times to grow them in pots but to utter failure. The best policy would then be to leave them in peace on the jungle floor where they truly belong. Finally what a field day when I saw a Licuala clump ( unfortunately being hit by a fallen tree trunk) with a bunch of unripe Licuala seeds . Guess I'll use them for germination later. I have seen this plant first time.